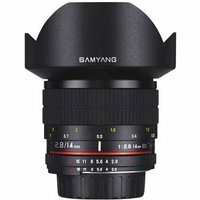 The Samyang 14mm f2.8 ED AS IF UMC is a super wide-angle lens designed to work with both full-frame and APS-C sensor cameras. Its optical construction features 14 elements in 12 groups and combines two ED plus two Aspherical elements (hybrid and standard). All lens elements are Ultra Multi-Coated (UMC) with the highest-quality new-generation antireflective layers. This optical construction as well as state-of-the art materials allows you to take photos of the highest possible quality. UMC stands for Ultra Multi Coated, which indicates that the lens has been covered with multi-layered, anti-reflective coating which minimises reflections and increases image contrast. Thanks to its maximum f/2.8 aperture the lens ensures great low light performance. This lens is a manual focus lens and does not autofocus (AF). Compatible with Sony's full-frame a7 II, a7R II and a7S II compact system cameras.